A Life Overseas – Failed Missionaries and “But God”…. Readers – I’m at A Life Overseas today talking about failure. I would love to have you join me! When my husband and I left what was supposed to be a three-year missions commitment in Pakistan after one year, we were angry, hurt, and deeply wounded. We didn’t leave Pakistan, but we did leave a missions community that I had been a part of since birth. This community had raised me, loved me well, and shown me a lot of grace. Though there had been times of deep pain, loneliness, and misunderstanding in my childhood, I had been nurtured and loved in extraordinary ways, and those were the memories that I held to. I had failed at the one thing that I thought I would be great at. 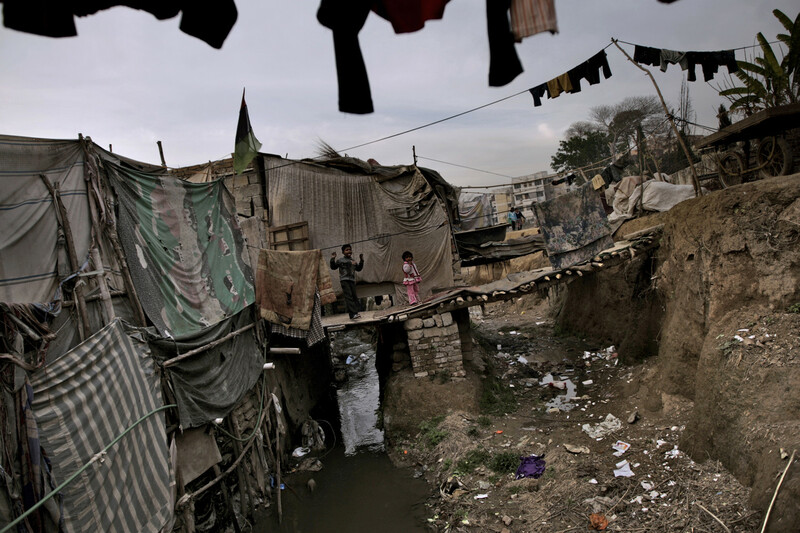 We moved to the capital city, Islamabad, and my husband began working for a USAID program. Pregnant with our second child, I stayed home with our little girl and began to meet other expatriates in the community. We ended up making deep friendships at our international church, and on the surface we were doing well. But the wounds of failure went deep and soon gave birth to cynicism and anger toward the entire missionary community. “They” had hurt us. “They” were hypocrites. “They” were spiritually superior. “They” made stuff up. “They” embellished facts to get money. WE however? WE were real. WE were genuine. WE admitted failure. WE lived off our own hard-earned money, thank you very much. WE loved Pakistanis more than “they” did. It was exhausting. Because we all know that bitterness and hatred are a bitter poison to drink. And while cynicism, when analyzed, can be a tool for discernment, we didn’t analyze our feelings. Because that would have taken work. Yes, we were hurt, but we were also lazy. We did what we had always challenged others not to do – we made broad, sweeping judgments and used labels. Ultimately, labels are lazy. We desperately wanted to cut ourselves off completely from missionaries, but here was one of the problems: My entire family was involved in missions in some capacity. My parents were career missionaries. I had brothers who were connected with missions in tent-making roles. I had other brothers who were pastors, or on missions committees. And then there were our friends around the world, working in some amazing, quietly world-changing projects. A Christian Ashram in Varanasi; medical work in various parts of the world; work in translation and education – people working in these projects couldn’t just be labeled, because they were our family and friends and we did believe that their work mattered, that they mattered. There were times when we longed to wear the title of missionary again. We had been schooled well, but incorrectly, that missionaries were a level above average. We struggled, feeling like we had fallen out of favor with an exclusive club. Sometimes it left us angry and cut off from connection with like-minded people. Other times it was a relief. But God in His gracious big picture view knew that it wasn’t the title or the place for us. Through all the travel and all the moves, I’ve hung my heart a lot of places around the globe. But none is so special as Pakistan. Over the weekend we visited Pakistani friends in San Diego who are very dear to us. Rehan was my husband’s best friend during college. The friendship continued strong through marriage, kids, and now adult kids. We don’t see them often enough, but when we do it is non stop talking, eating the best Pakistani food in the world, and laughing hard. The conversation moves from one topic to the next without a gap. We interrupt each other, go off topic, and we’re loud. It is always delightful, and this time was even more so. Beyond the blue skies, Palm trees, and ocean was a house alive with warmth and hospitality. I didn’t want to leave. My heart was so full! Full of friendship and Pakistan; memories and curry. But too soon the visit was over and I’m now sitting back in Boston, in a house that feels cold, with a heart that aches with the leaving. When you’ve lived across the globe, you end up sharing your heart with a lot of people. Each one of them holds a small piece that makes up the whole, rather like a mosaic with bits of colored tile that an artist fits together to create a beautiful piece. But when you’ve left your heart in so many places, it’s also hard to come home, especially when home feels cold and lonely. 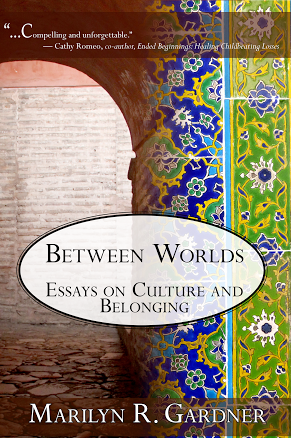 Edward Said talks about exile and the “unhealable rift” between humans and their native places. My native place was Pakistan, a place far from the one marked as legal on my passport. So when I experience these times of connection, no matter how short, that unhealable rift is filled with the salve of understanding. That’s what I feel right now as I sit on my couch. A lonely cat is cuddled as close as possible to me, willing me to never leave again. I know how she feels. I hate leaving those I love. I hate the loneliness I feel when I walk in to a cold house in a place where I have to work so hard to belong. My heart is a dead weight, my sighs fill up the silence. Frederick Buechner says this about loss “What’s lost is nothing to what’s found, and all the death that ever was, set next to life, would scarcely fill a cup.” I read it, but right now I’m not sure I believe it. The thing with feelings is that they can change in an instant. 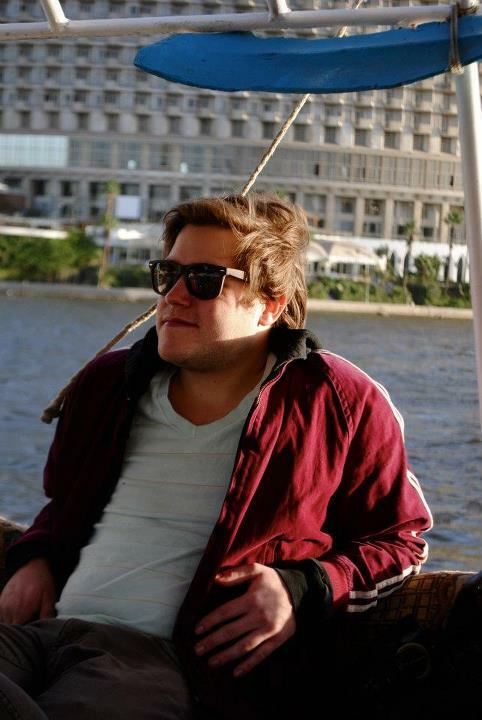 So I sit with a heavy heart filled with memories of those I’ve loved around the globe. Some gone, some still present but far away. These feelings will pass, my heart will feel lighter, my memory bank fuller. But right now, I sit, holding on to archived memories to give me strength. Sights, sounds, and smells can transport us to places we love in mere seconds. I hear the Call to Prayer and suddenly I am in Pakistan, walking the dusty streets of Shikarpur. I smell curry and shut my eyes – I could swear I am at the Marhaba in Murree. But I’m not, I’m in Central Square, the fragrant smells of the Indian restaurant wafting across the street luring me back to my childhood and begging me to enter. The imagination is a wonderful, terrible thing. Last night I refilled my masala dhaba, My masala dhaba is a spice box that my husband gave me seven years ago. It was one of the loveliest Christmas presents that I have ever received. Yesterday, as I took spices out of their boxes and bags and put them into my masala dhaba, I was like the character in Mayle’s book: vividly transported back to my childhood. 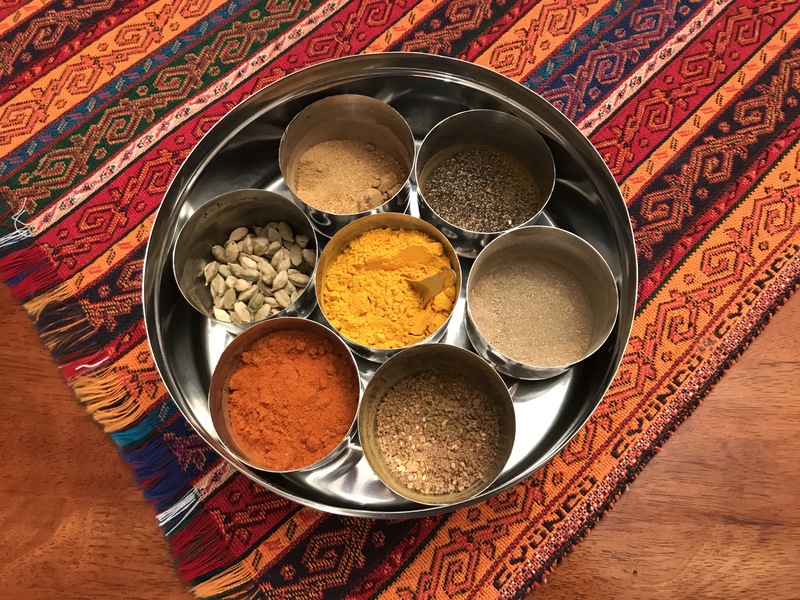 I wrote the piece below after I had received the gift and I offer it today – a tribute to spice, color, and memories. For years I have kept my Pakistani spices in a large Tupperware bowl with a red lid. The kind that you use to bring the gargantuan pasta salad (that no one will eat) to a potluck dinner. The lid is sticky with the years that the bowl has held spices and (sometimes) dust. Christmas 2010 I received a proper spice box as a gift. Not a western spice rack, but a genuine masala dhaba (spice box) of stainless steel. Yesterday, while making a chicken curry, I transferred the spices from the Tupperware to the masala dhaba. It was like someone had told me I had won the lottery. I can’t stop looking at it. It is shiny and beautiful, full of the colors of Pakistan – yellow/orange turmeric, red pepper, black pepper, red/orange masala spice, light brown coriander, darker brown garam masala, and to add a Middle Eastern flare – green/brown zahtar. The spices sit like contented children in a circle, satisfied in their round stainless steel bowls. A small spice spoon pokes out of the bright orange-yellow turmeric in the center. The lid is see-through so the colors are visible even as the spices keep fresh. It is magnificent. These are the things I love about where I was raised. The simplicity of colorful spices, the feel of a dupatta over my shoulders as I wear a colorful, silk shalwar kameez; the smell of curry cooking, and anticipation of hot naan and samosas to come; the glitter of bright-colored bangles in a shop at the local bazaar. I love being able to duplicate these small things even as I look outside and hear the sounds of my current reality. Sounds that make me feel like Dorothy in the Wizard of Oz as she realizes she is not in Kansas anymore. As soon as the angry words came out of my mouth, I regretted them. I was speaking to Rehmet, the woman who helped me care for my kids and my home. She was a Punjabi woman, uneducated, illiterate, with a smile that stretched across a beautiful, weathered face and a personality as big as her smile. We were living in Islamabad, Pakistan and Rehmet had come into my life by way of her husband who had done some handiwork for us around the house. She had five children and lived in a slum on the outskirts of the city. She was tireless in her energy and her talking. At one point I despaired to my mom that I couldn’t understand her. “She speaks so quickly!” I wailed. “My Urdu can’t keep up”. My mom began to laugh – “Don’t worry” she said. “She’s actually speaking Punjabi”. We had slowly developed a relationship that went far beyond employee/employer. I considered her my friend. We would sit down with tea, communicating with my limited Urdu and her fluent Punjabi. We would mate socks together, cook, scrub vegetables, and rearrange furniture. She loved my kids, and I thought I loved her. But there we were. A Pakistani woman and an American woman side by side, me letting my tongue loose. She had ruined some clothes by bleaching them and I was angry. After all, I self-righteously reasoned, if this had happened at a laundry facility in the United States I would voice disapproval over the mistake and demand my money back. But, I was not in the United States. Looking back on the event, I cringe in embarrassment. I don’t even remember what the clothes looked like – but I will never forget the sadness and resignation on Rehmet’s face. She looked as though she had been kissed by a Judas, betrayed by one she thought she knew. I began to apologize. My speech, so articulate while angry, suddenly lost any semblance of cohesion. I was fumbling over my words, over my grammar, most of all over my ugly heart. I went cold. I would rather have heard anything but this. I would rather she yelled, screamed, got sarcastic, quit the job… anything would have been better. I, the person who talked long and wrote hard about wanting to empower people, had taken advantage of what I knew to be a cultural value – a servant is subservient to the employer. In a culture where she was a minority as a woman and as a Christian she would never have other opportunities, this was her fate. Even if she wanted to walk out on the job, she couldn’t have. Rehmet did not have choices and I had used that against her. I had taken advantage of education, relative wealth, and influence in my ridiculous reaction to a simple mistake. It was important to confess – to Rehmet, but also to God. For I had acted in a way that hurt another, had wounded knowing she had no recourse. Rehmet and I were able to repair the relationship, largely because of her generosity of spirit and sheer joy in life. In her bucket of life experience, this was small change and she would not remain low for long. But the story has stayed with me, for it reminds me of how important it is to have cultural humility. For cultural humility demands a process of self-evaluation and critique; a constant check of attempting to understand the view of another before we react and recognizing our own tendency toward cultural superiority. Cultural humility gives up a role as expert, instead seeing ourselves as students of our host culture. It’s a hard subject that demands honesty but what do you do when you have caused offense? When you have wounded in a place where you are a guest? When you have exhibited cultural superiority instead of cultural humility? Friends, there is a giveaway of Passages Through Pakistan on Goodreads! It ends on June 7th, and two books will be given away. In honor of the giveaway, I’ve included an excerpt from the book on friendship and loss. I hope you enjoy! Also – the electronic version of Passages will be released on June 15! Friendships formed in our small community were and are unique. We forged relationships with likely and unlikely people, and they occupied our hearts and souls. Together we faced birth, death, tragedy, sickness, political instability, separation from blood relatives, car accidents, boarding school, tension in relationships, food rations, and so much more. These memories and events were woven together into an immense tapestry. But unless cared for, a tapestry gets loose threads, and those threads can unravel into holes – holes of too many goodbyes, unraveling of loss. We push the losses aside, dismiss the goodbyes as just part of life, part of being third culture kids. But buried losses don’t stay buried. Like a submarine, they eventually surface, and we realize that they were never gone. 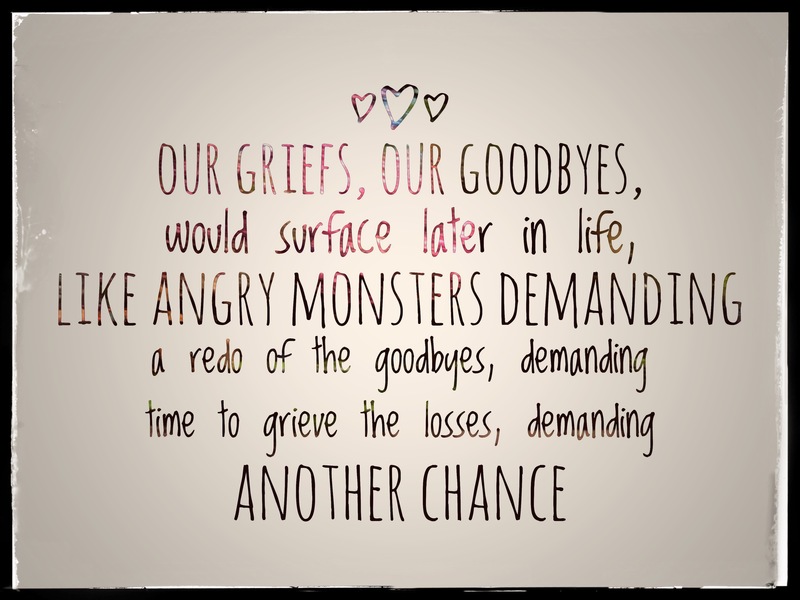 So our griefs, our goodbyes, would surface later in life, like angry monsters demanding a redo of the goodbyes, demanding time to grieve the losses, demanding another chance. But we get only one chance at childhood. When that childhood is lived thousands of miles and oceans away from the place you live as an adult, you can’t go back. When our childhood is good and lived with a sense of wonder, it outweighs the pain and grief that came along the way. We may long to recreate it, perhaps because in it we see something of what the world should be, what the world could be. But recreating it is an impossibility, and in our case, even revisiting the places and people was impossible. …Like so many things in childhood, I didn’t know what I had until I lost it. I didn’t realize the extraordinary community I had around me until I was no longer in Pakistan, until I had to forge my way in the rocky and seemingly hostile territory of my passport country. Purchase Passages Through Pakistan here. I read the words and my eyes brim with tears. I’m sitting by the window and bright sun radiating off fresh snow bathes the room in cold light. I read the question again “How do we say that God is good when life is not?” When you bury a child or a parent too early, and Job’s comforters tell you they are in a “better place”. When you watch your body succumb to cancer, and you know that you will not live to see your daughter’s fifth birthday; when your husband of less than a year dies in a tragic accident – how, then, do you say that God is good? At the end of a life, every single human being has a reason to believe God is not good. But the opposite is also true. At the end of every life, there is evidence of God’s goodness in every breath we’ve been given. It is tempting to want clean answers, to be able to point to healings and miracles. But clean answers have never helped the one who is suffering. How do we say that God is good when life is not? There are no easy answers. We limp our way through this question, sometimes full of faith and confidence that the character of God is ultimately good; sometimes shaking our heads saying “Lord I believe, help my unbelief.” Theologians call this ‘theodicy’ – a noun that literally means “the vindication of divine goodness and providence in view of the existence of evil.” Vindication of divine goodness – God on trial, his very character being questioned. As I think about this question, I realize that this is some of the thread through Passages Through Pakistan. 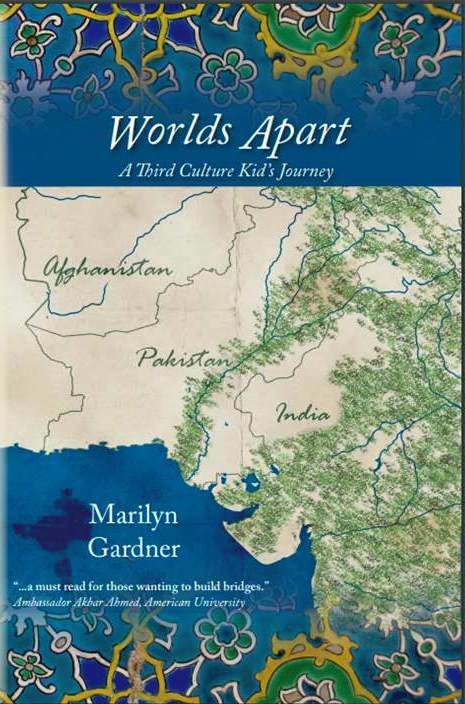 Yes, Passages is about Pakistan, and being a third culture kid/missionary kid, and living between worlds. But ultimately, Passages is my testament of faith. In Passages I work through what it is to believe God loves, God cares, and God is good when life is not. The tapestry of God’s redemptive plan is not without pain or suffering, but ultimately I have deep confidence that God is good, even when life is not. This I knew, and I knew it well: when you’re six and you wake up at five in the morning, away from home and unconditional love in a dormitory of seven other little girls, just as young and equally homesick and insecure, there is no one to comfort you. When you are twelve, and your backside aches for a week because of the beating of a house parent, there is no person to comfort you. When you question why dads and babies die in the middle of the night, there is no person to answer you. When you are sixteen, and you feel misunderstood by all those around you, unable to articulate your heart, there is no person to comfort you. When you are eighteen, and your heart is breaking at the thought of leaving all you know and all you love, there is no person to comfort you. Readers – Rachel Pieh Jones has published a review of Passages Through Pakistan. You can read it here.